In the early part of the twentieth century, Woodrow Wilson‘s America decided upon an Isolationist Foreign Policy concentrating their efforts on the battles at home. 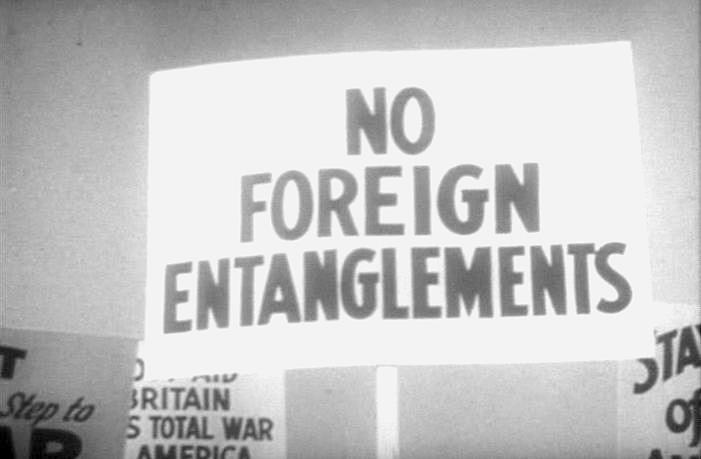 It wasn’t a new strategy – since the days of George Washington, the country as it emerged tried to distance itself from foreign entanglements, notwithstanding repeated encroachment on its borders by regional competitors and the death throes of European Power. The German ascendancy in the Atlantic finally forced their hand, and in order to protect the interests of America the country was forced into the war, and away from its isolationism. America, it appeared, could only advance her domestic interests if actively engaged on the International Stage. Throughout the twentieth century, isolationism has become effectively impossible. The process of globalisation, and global sourcing in particular, along with economic, technological and communications integration has meant that all countries in the world are now interdependent to a greater or lesser degree, with the possible exception of North Korea. As Ann-Marie Slaughter described on her Ted Talk we blogged about here, the modern sphere of international relations is dominated by networks, not states, that include NGOs and Multi-National Corporations as well as states themselves. To exist as a state, therefore, is expressed through membership of one or more of these networks. Russian premier Vladimir Putin recently criticised Barack Obama’s claim to American exceptionalism. In his conclusion, Putin remarked that “…[t]here are big countries and small countries, rich and poor, those with long democratic traditions and those still finding their way to democracy. Their policies differ, too. We are all different, but when we ask for the Lord’s blessings, we must not forget that God created us equal.” Obama must have squirmed reading that – it could have come out of the mouth of Elanor Roosevelt in 1948. Now, one would hope that Obama’s people put some thought into the choice of phrase, but it’s hard to avoid agreeing with Putin. That said, America’s place in the world is unique; it controls the preponderance of wealth, technology and military power and while that may be changing, it is true today. That presents it with unique challenges and obligations – and in that respect, as a nation, America is exceptional. But American people – to paraphrase Putin – are no better, or no worse than other people around the world, and to presume anything different is fundamentally in opposition to the principles that define American democracy itself. Now Grayling was talking on the radio, rather than in a scripted forum like Obama’s UN address, and so some leeway can be afforded for a poor choice of phrase. But it does form part of a pattern connected to the Tory concern with the rise of UKIP, and right-wing nationalism generally where they are trying to appear stronger on Europe, and pandering to a saccharine nostalgia for Empire, and a place in the world that simply no longer exists. Exceptionalism, once more. If isolationism was the policy of choice for those that wanted to advance the domestic agenda while still in the process of building the nation state, then perhaps exceptionalism represents its new incarnation in the advancement of the national interest for the mature democracy. “We are a superior nation / economy / society / civilisation,” so the narrative goes, “and our leadership can show the way for others to follow. In such circumstances, we will exert a soft power over a discrete network of our choosing – preferably less well developed states – and construct a global network around us.” It is a new kind of future building, one that carefully sustains the domestic interest, while selectively building the network. In such circumstances it is important to avoid competitors for that position of influence. Clearly the economic strength of the Germans and the Cultural strength of the French would represent a threat, and therefore to position Britain in that theatre would be counter-productive. Therefore its new exceptionalism is not absolute isolationism, just isolation from competitors. Find or build a network where the country stands out, and invest in it. There, perhaps, lies a more prosperous future.